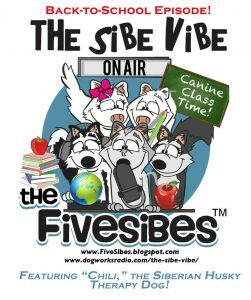 Join host, Dorothy Wills-Raftery as she presents, The Sibe Vibe on Dog Works Radio. It’s September and that means it’s Back-to-School time! Our guest is Samira Mahjoub Tapia and her Siberian Husky “Chili” the Therapy Dog, an alumni of Husky Camp Rescue in California. Chili brings smiles to many, including kids at local schools, children and adults at local libraries, and residents of nursing homes. He also goes to college to help “de-stress” students from exams. 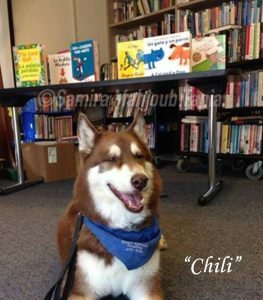 Chili and Samira are members of BARK (Beach Animals Reading With Kids) Therapy Dogs. You can check out BARK’s website at: http://barkdogs.org. The Sibe Vibe presents Woundwear, Inc.
Robert here. I would start out with just one or two dogs on a bike first and make sure that they not only learn what it means to pull but also have a great time doing it. Trying to train eight dogs at once is just way too many parts of the puzzle trying to fit together at once. Once the dogs are learning how to pull you on your bike then you can start adding in commands for left, right, go, stop and take a break. One of the most important things you must learn in mushing is patience and knowing that if the dogs do not want to go you are not going to go anywhere. Hi Richard! Thank you for tuning in to the show! Thanks Robert, for sharing your expertise and replying with such great info. Richard, I hope you join us again!